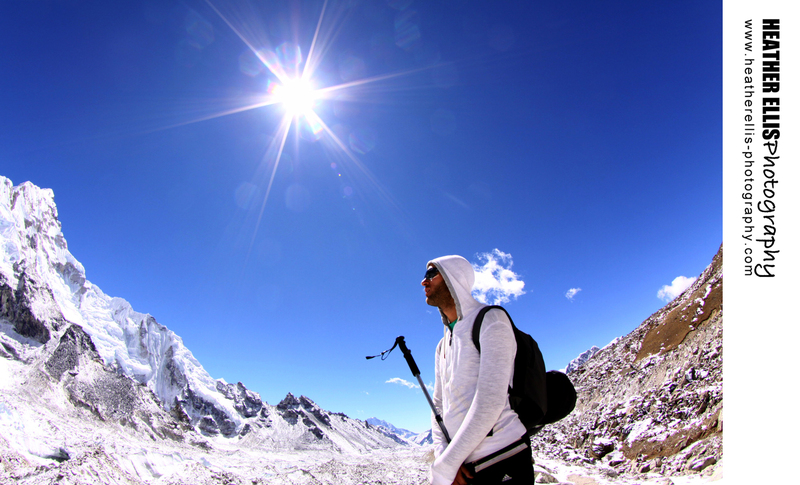 I’m so pleased to FINALLLLLYYYY be able to share our experiences trekking in the Himalayas with you. 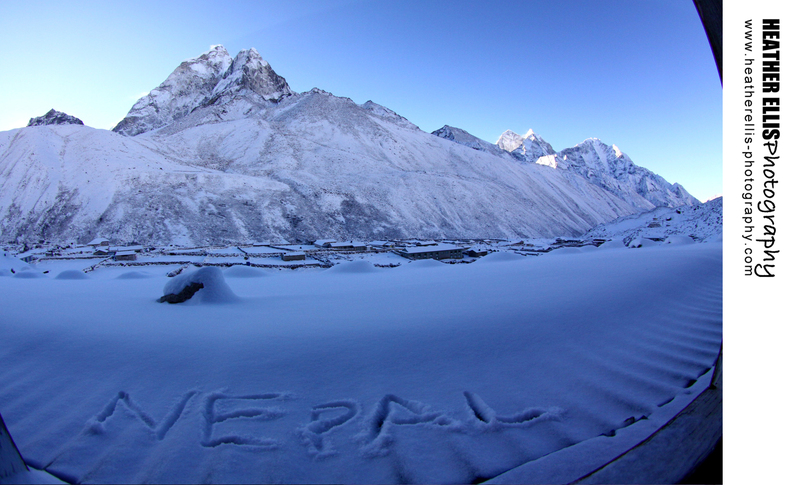 We started in Nepal on Feb 22nd, arriving in Kathmandu after a very long trip at midnight. The kind bag assistant at the Kathmandu Guesthouse carried our bags to the 4th floor and got us some water…I was sooo tired, I wanted to give the guy a tip but we had nothing smaller than a 20 so I stiffed the guy completely…in the morning I realised that 20 rupee is a mere 40cents. I felt pretty bad!!! 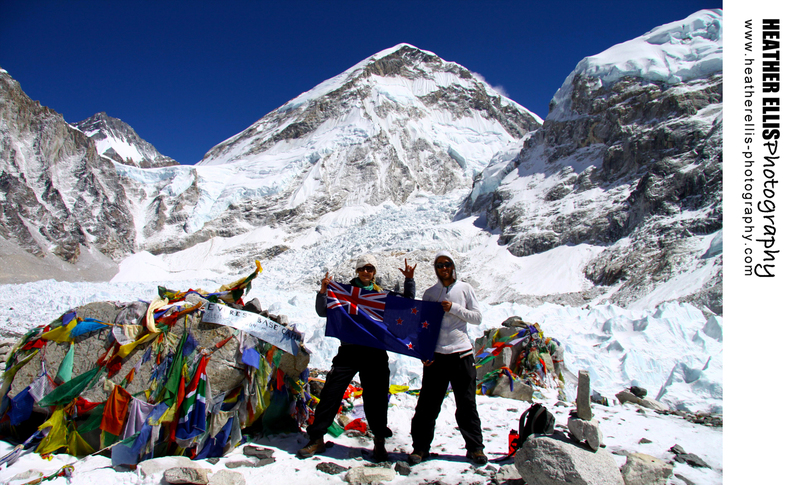 On Feb 24th we met our Intrepid Guide and tour group for the Trek to Base Camp of Everest. All men and just the 1 girl- me. A good group of Aussies and NZer’s. Feb 25th we took a very early flight over the Himalayan Mountain range into the shortest runway strip ever, on the side of a mountain to a place called Lukla. The wings were clipping sides of mountains and the plane was a small 12 seater..turbulence frightens me in 737’s or Jumbos, so you can imagine how it would feel in such a small plane. Day 2: We ascended to the mountains biggest township called Namchee Bazaar… I’m not going to lie to you… I hate uphill…it was a little hard. Here we stayed at 3480m for 2 nights with day 3 being an acclimatisation day. On this day we acended up the hill to 3800m and then back down. This was our first view of Mount Everest. Day 4: From Namchee Bazaar we took a massive 7 hour ascend up some pretty steep hills to Portse, 3810m. This was exhausting but you just feel yourself refusing to get tired, which was good because there was still alongggg way to go. In Portse was my first wash since Kathmandu. It was cold water out of a tin bowl in a small tin shack.lol. We saw Everest again today. 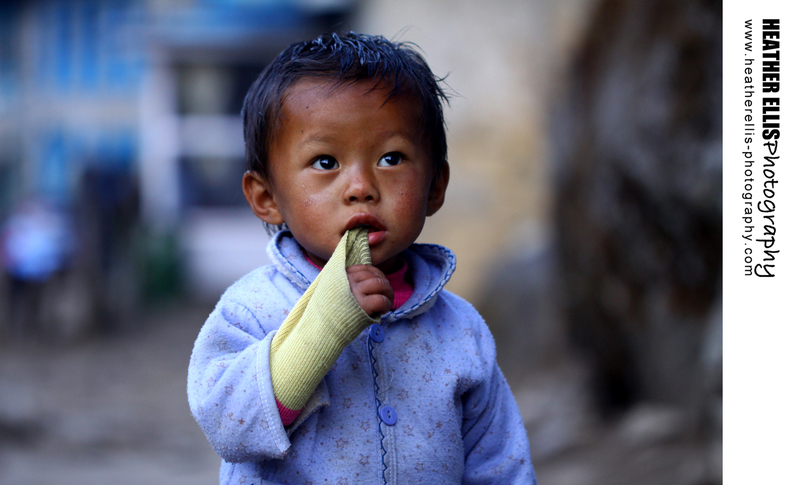 Day 5: Portse to Dingboche, 4410m. 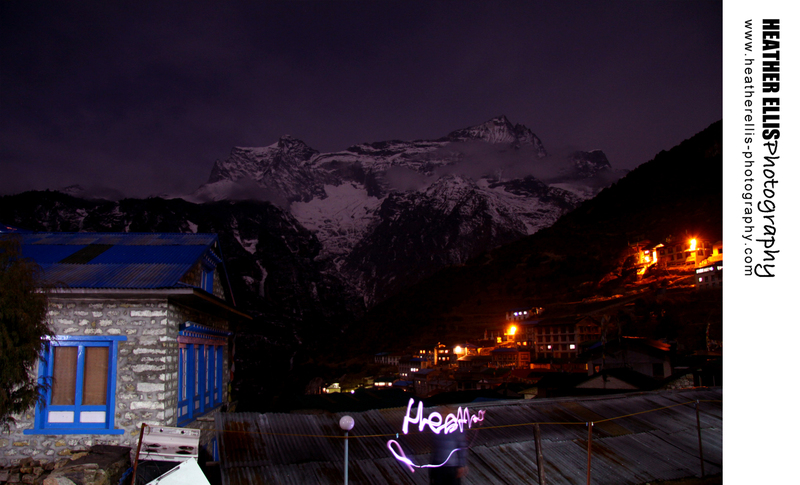 Dingboche was one of my FAVOURITE places, made especially special by the fact that that evening it started snowing and it snowed right throughout the night. Waiting for us when we awoke was 6 inches of the softest, most powdery snow which featured in making a winter wonderland. 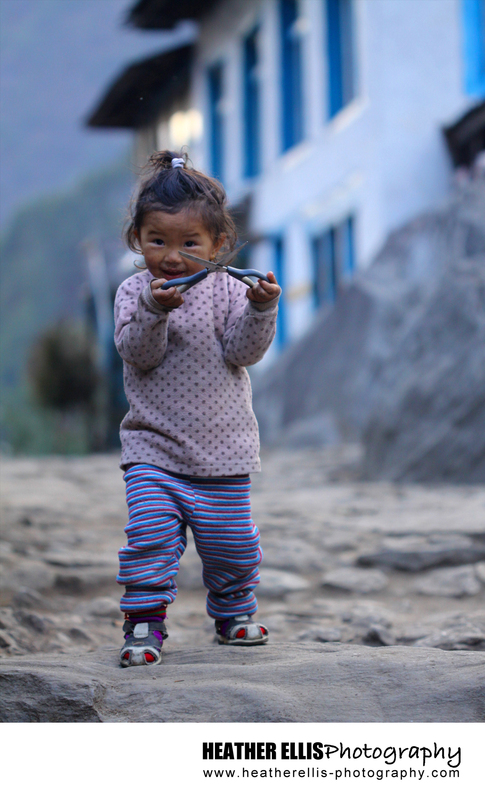 Lucky for us this was our 2nd and final acclimatisation day, so we trek through the village and up 400m to the Ama Dablam Base Camp. It was tricky going up, a bit slippery, but reaching the top was amazing! 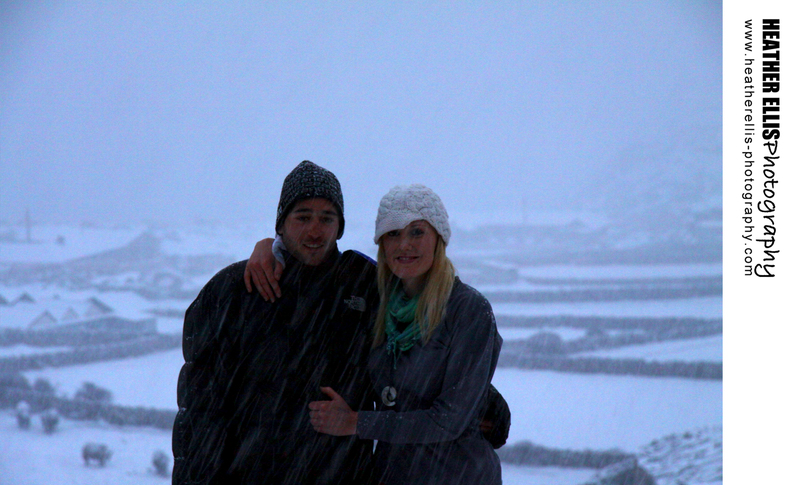 We had snowball fights, I made a snow angel and the view of surrounding mountains was unbelievable! This snowfall also made a difference to the landscape in the days to come. 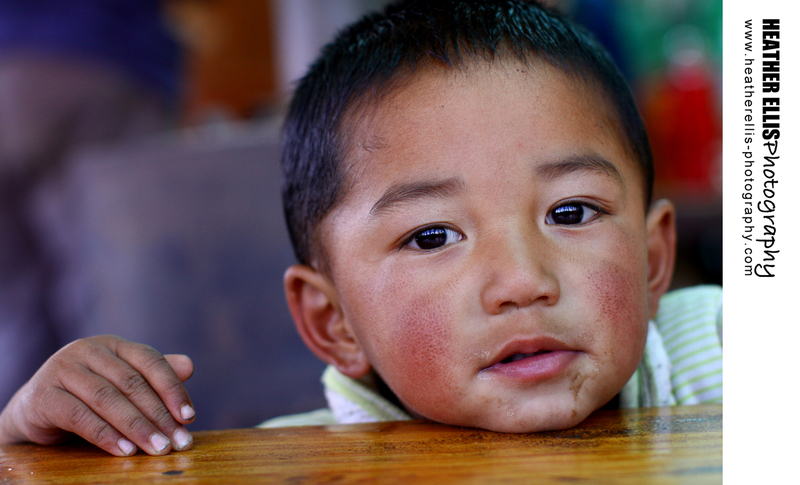 Day 6: Dingboche to Loboche, 4910. Well over the highest point Doug and I have ever been, no altitude sickness what-so-ever which was great, but a couple of the other guys did have constant headaches. 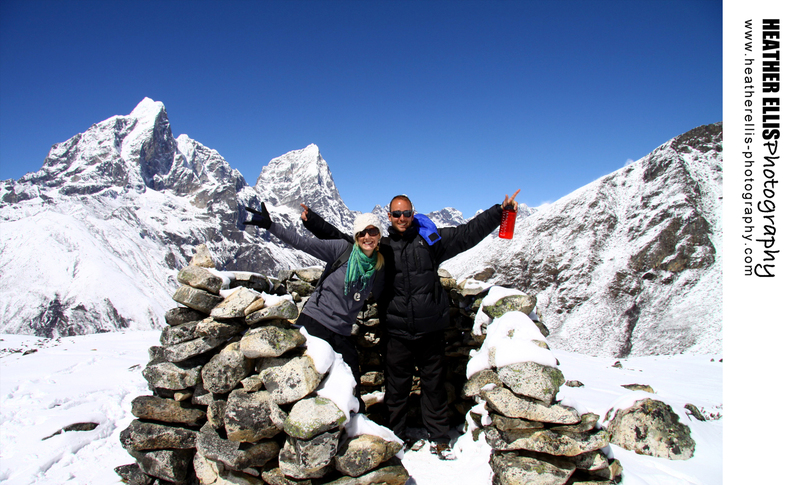 I asked our guide Ratna what ‘boche’ meant as alot of towns end in boche – Loboche, Dingboche, Tengboche, Pengboche etc. The best answer I got was “a man sent his sons to each town…. So I’m guessing there was once brothers named Lo, Ding, Teng, Pong and they set up the townships … lol. From Loboche we climbed another 100m and we could see the point of Everest Base Camp and the massive glacier that runs right to it. The landscape at this point we are right in the mountains, snow covered land, it was breath taking and the weather stunning!!! Day 7: This day was a longggg day. 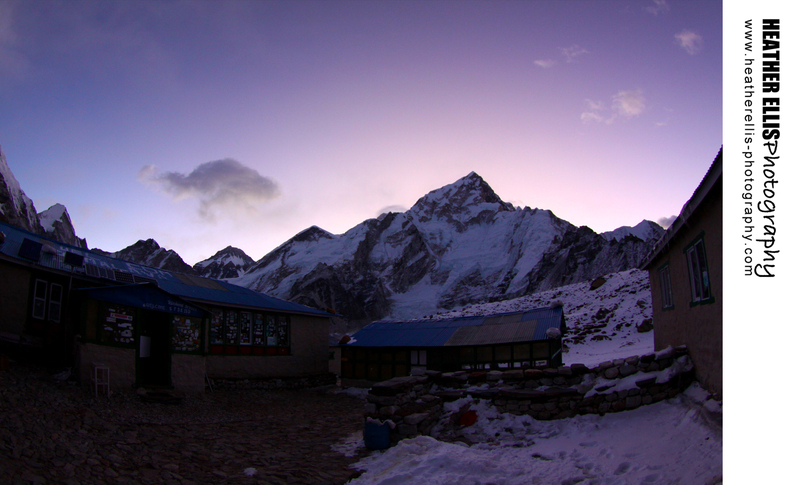 We made it to Gorak Shep, our final tea house, 5140m. 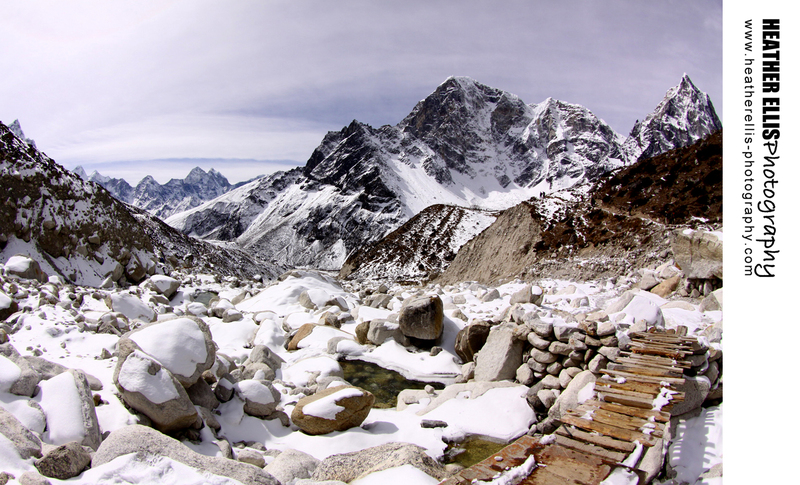 And then to our intended destination that was The Base Camp for Mount Everest. This was another favourite day. Not necessarily for Base Camp itself but for the walk to it. With white mountains and blue skies, the glaciers were massive and phenomenal and it felt like the mountains were an ampi theatre which was breath taking. We could see Everest nice and clearly and I didn’t realise how closed in the mountain was. I guess that’s why it took them so long to realise that it was the worlds tallest mountain. That night Doug and I stood outside and Doug said to look up… a million and one stars filled the clear night sky, it was quiet, there was no technology, there was a faint sight of the mountains in the nighttime and it was obvious that this was as perfect as a moment can be! 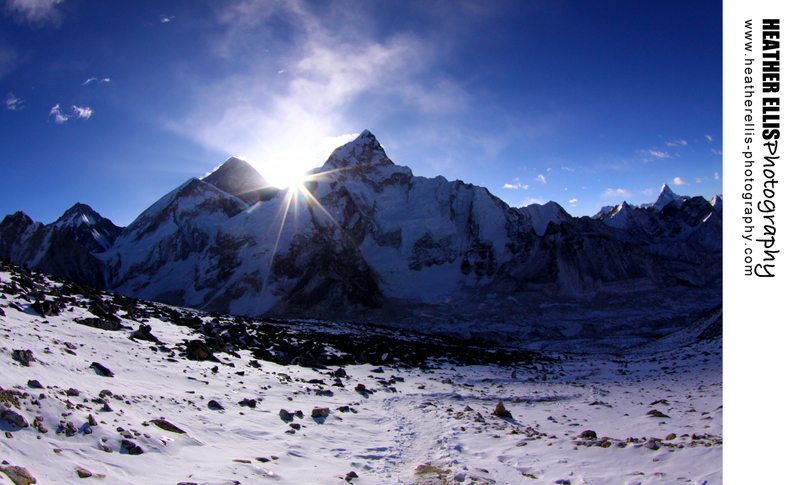 Day 8: Wow… the big march up Kala Patthar, at 5550m we were warned that there is 50% less oxygen. 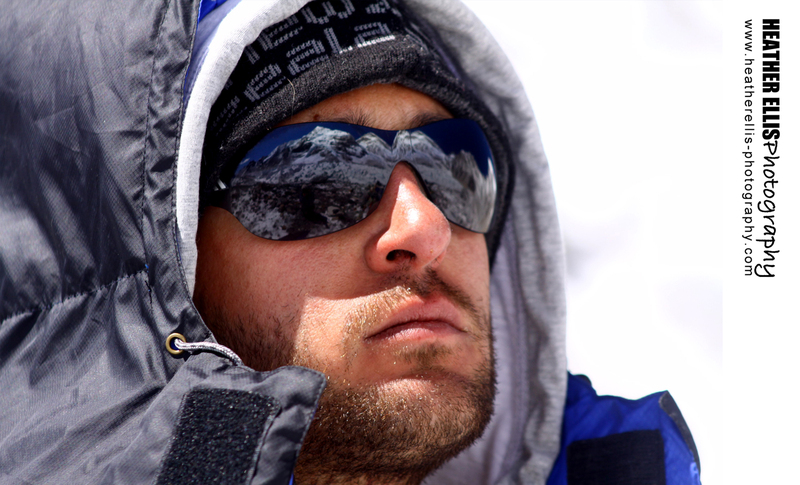 I’d agree with that… I was racing up the mountain against the sunrise which comes perfectly over Mt Everest… but at 5500m I was slowing down rapidly..I could barely breathe and at that moment I thanked above for the fact I don’t have asthma! It was hard to enjoy Everest from such a wonderful angle considering I couldn’t blimen well breathe! Ironically I’d specifically saved my batteries for this moment and when I got up there I was a huffy cry baby who didn’t wanna take a photo or do anything. Not to mention it was the coldest we had had at -10 degrees. Doug, nicknamed “The Snow Leopard” didn’t have any probs. What I haven’t mentioned yet is that we went at the perfect time. The tracks were practically empty and all tea houses we had to ourselves. Coming back down we noticed a lot more trekkers being it is March. Apparently people barely touch Feb, which was great for us. 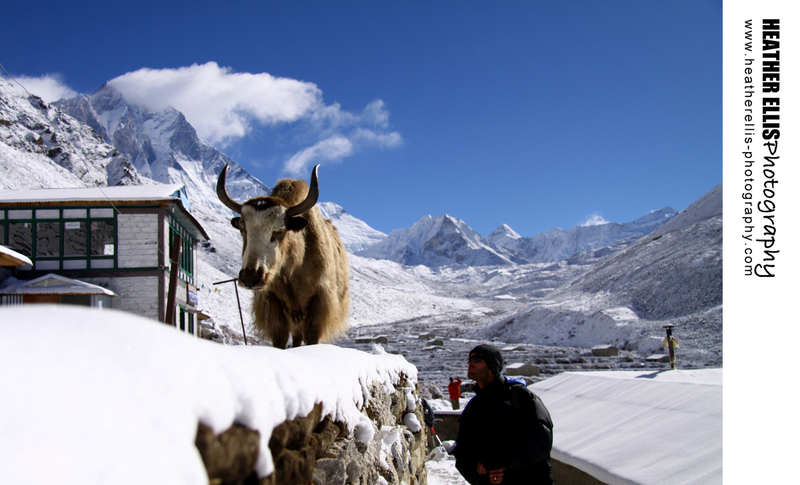 In the busy season, a walk that should take 4-5 hours can take up to 7, 8 or even 9 hours waiting for Jopaks,Yaks and other trekkers to pass. Our guides were sooooooo awesome! Indra was the main, he looked like a cheeky monkey, such a great guy and then there was Ratna who started every trip with “Jam, Honey, Peanut Butter” – “Jam Jam’ means ‘lets go’ in Nepalise. Then there was Ashok, 22 years old, nicknamed ‘Fabio’ best looking man in Nepal.lol. I wont deny that, however I haven’t met every man in Nepal. 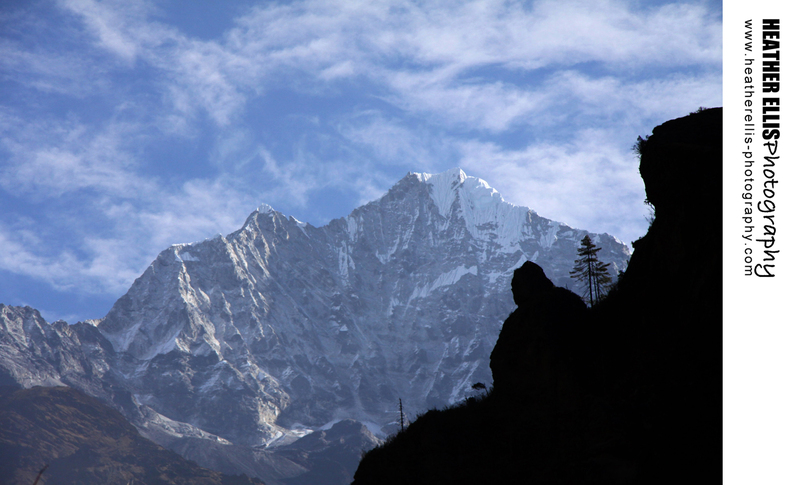 Orsho-Namche, then Namche to Phakding. 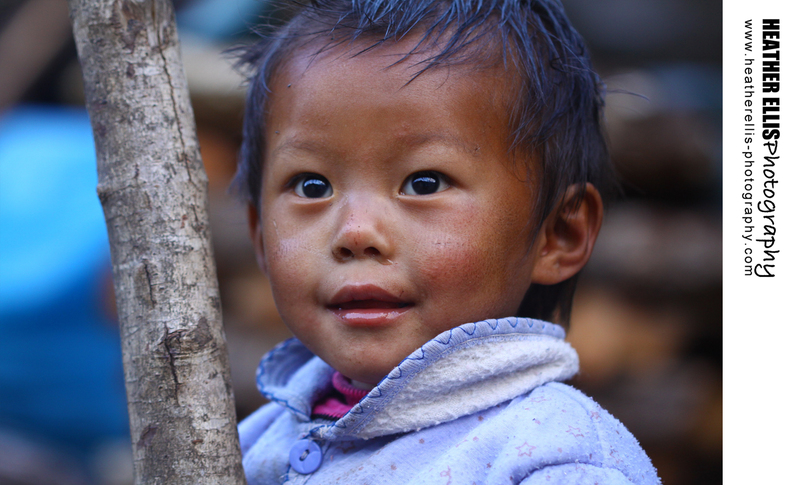 I got some gorgeous shots of some kids in Phakding. Although I wonder about the parenting, one little girl was running with scissors, two others were playing with plastic bags fully covering their heads. Our final night in Lukla we drank Everest beer, played pool with cocktails, had Starbucks lol and all the porters, guides and team had Dal Bhat with our hands. Dal Bhat is Rice, curry poppa doms and lentil soup. OMG sooooo good after you’ve been living in soup for almost 2 weeks! 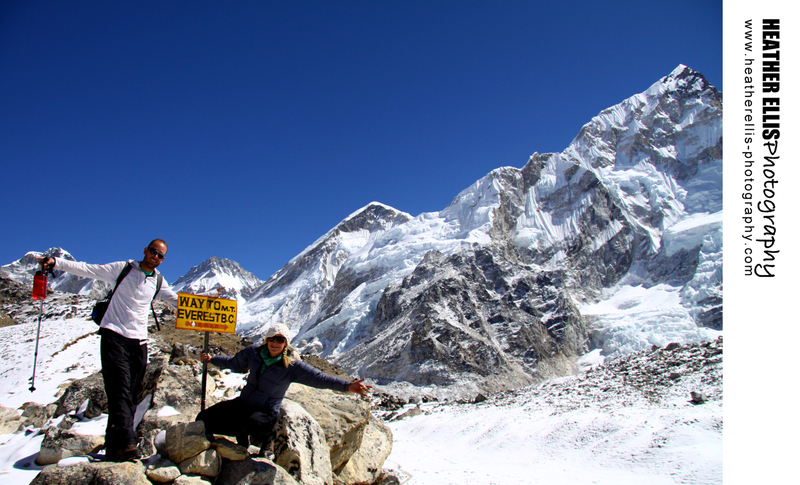 Personal: Base Camp of Everest Please!